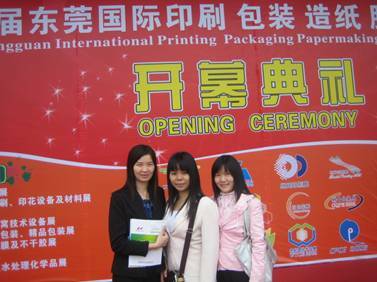 The second largest print fair over the world was hold in houJie town, dong guan city in 9th to 13th April 2011. It attracted exhibitor more than 1100, buyers and professional visitors from home and abroad more than 12 million. This big show is about all kinds of printing machine, including offset printing machine, flexographic printing presses, screen printer, heat transfer machine, heat press, etc. As a host our company attended the fair at the first floor area NO.5 1005. we showed our screen printer, UV dryer and heat press machine, we printed some paper sample and t shirt sample for the audience, they watched printing process and satisfied with free samples. One <?xml:namespace prefix = st1 />India customer bought a small heat press on the spot and bring it back to Bombay.